Hircine is a Daedric Prince whose sphere is the Hunt, and is the creator of lycanthropes. He is the master of Ulthorn the Hound and his Houndsmen, granting them lycanthropy so they may overtake Malabal Tor. The Hunting Grounds are his realm of Oblivion, and the Huntsmen are his Daedric soldiers. He appears within the March of Sacrifices, hosting the Great Hunt for competitors hunting the indrik Tarcyr. For more information see the lore page. A Father's Promise: Help a mother find her missing daughter. The Ties that Bind: Search for any surviving Thalmor soldiers at Wilding Run. 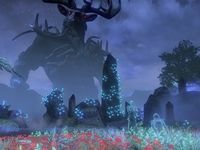 The Heart of the Beast: Help the Glenmoril Wyrd recover their temple from the Reachmen. Hircine's Gift: Gain Hircine's blessing to become a werewolf. Hircine: "My boon shall be given to the hunter who brings me the heart of Tarcyr. But know this. Only the strong survive my March of Sacrifices." Balorgh: "Yeah, yeah, you walking flank steak. We get it." Foral: "You would do well not to mock the Huntsman in his own realm, leaf-eater." Balorgh: "That so? Well, I'd worry more about yourself and less about your precious Prince, runt." 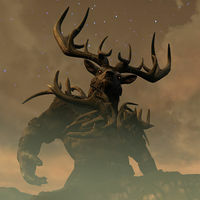 While hunting down Balorgh, you will overhear him have a conversation with Hircine. Balorgh: "What do you mean? I've brought you the heart!" Hircine: "Yes, but you were not the one to hunt my Hare. Why should I grant you this favor?" Balorgh: "You want a hunt? Fine! I'll hunt down the ones who killed that beast in the first place!" Hircine: "Intriguing. Very well. Bring me their hearts, and the boon is yours." After Balorgh has been killed, the following conversation will occur between Hircine and Hanu. Hircine: "Quite the thrilling hunt. My boon is yours, child of Azura. What do you seek?" Hanu: "Freedom for myself and my father. Release us, so we may join our ancestors in death." Hircine: "I hear two requests child, not one. You must choose. A heart for a heart is only fair." 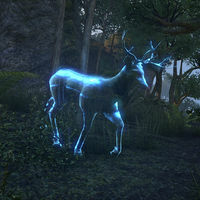 Tharas: "Use Hircine's boon for your own freedom, Hanu. You don't deserve this fate." Hanu: "Father, I....I don't know if I can do that." "Do you remember, Ulthorn? So sad, so full of hate. It still burns!" "She cast it away, Ulthorn! For another, for forever!" "No, Ulthorn. Not that one." "Ha! And then, Ulthorn? What comes next?" "In the end, you came to me. And the Shade of a [sic] Ulthorn has been with me ever since." "Another comes for my blessing? Drink deep, and let the beast behind your eyes take hold. Ah, but is that fear I smell? The young Bosmer fears what the future holds. Her flesh is weak, but not for long." What have you done to Firwin? "How ungrateful the little Elf is! She took the gift willingly, and now she wishes to turn away. Her flesh and blood are mine, but I am not without mercy. Perhaps she can save someone... her mother... from the same fate." What fate? What do you mean? "The Elf child must take the heartblood from her sire. If her mother drinks of it, she may yet be saved. But there is no redemption for the child. She is mine." "You desire power, but have you the will? The God of Schemes has tasted your soul. You've come back tainted. Wrong. Hunt. Seek a tribute worthy of your pack. Bring it down, then howl for your brothers and sisters. If the pack accepts you, they will feed, and you will join them. Now, experience my power!" "Enough! The pup has become a wolf. Bow to me, hunter, and receive true power." Wyress Linnae: "Put her heart in the bowl on the altar." Statue of Hircine: "A worthy offering. What is it you seek?" Wyress Linnae: "My Prince, we seek to know why―"
Statue of Hircine: "Silence, prey! I speak not to the weak, but to the one who took the heart. This one interests me. Come. Speak to me, hunter." You must then speak to the Statue of Hircine. His dialogue will differ if you are a werewolf. "Ah, the prodigal pup returns. So you aid the Wyrd who still lick their wounds of defeat. They fell prey to Brinarch and his Reachmen, losing them my favor. To earn it back, you must prove yourself once more. Show me what you've learned." "You are not mere prey, mortal. Yet you aid the Wyrd who still lick their wounds of defeat. Their fall to Brinarch and his Reachmen lost them my favor. To earn it back, you must prove yourself a true hunter." "To start: a hunter's challenge of skill. Hunt my aspects within my Hunting Grounds: a shade of this realm and my own. Prove yourself worthy of my favor. Only then will you earn the chance to retake the grotto for the Wyrd." How do I get to your Hunting Grounds? "I will place you there. When you've won—if you've won―return to the shrine. I will be there as the Spirit of the Hunt. We'll discuss your prowess and your final task for the grotto when the hunt is over." All right. I'm ready to face the aspects. "Ah, the proven hunter. I see you have the briar heart, torn from the chest of the Reachman. His punishment for failure is to roam the Hunting Grounds as prey. His chest, a gaping hollow, a reminder of his weakness." Yes, here's the briar's heart. "Consider it returned. The grotto belongs to the Wyrd once again, but more importantly, to you. I'll be watching you, mortal. A larger hunt looms in your future, one I'll watch with great interest." "My hunter returns, briar heart in hand. Brinarch now roams my Hunting Grounds as prey. His chest, a gaping hollow, a reminder of his weakness. Heed his punishment, pup." "Ah, you truly are deserving of my gift. The grotto belongs to the Wyrd once again, but more importantly, to you. Shrines to Hircine depict him holding two spears with two wolves at his side. There is Daedric text inscribed at its base that reads "YFCILS IVS BYA OCIYPZIYP AS OCIYP AS YFCILS IVS BYA OCIYP AS", which is most likely gibberish. He is voiced by Keith Szarabajka. 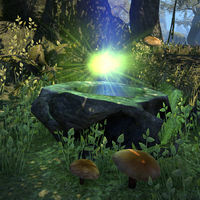 The healthbar for Hircine may briefly appear when Tarcyr hides and summons its thralls, where he is shown to have 15000 health. This page was last modified on 23 March 2019, at 18:07.